Yes, it is all finally coming together! An incredibly exciting weekend filled with a competition, Workshops and Gala Show with Sherena, and a Jalsah! The weekend of November 4th-6th, 2011 promises to hold a little something for everyone! The Belly-Off in the 'Burgh! First up, we have the first ever BELLY-OFF brought to you by Janim, Berna, and Ishtar! 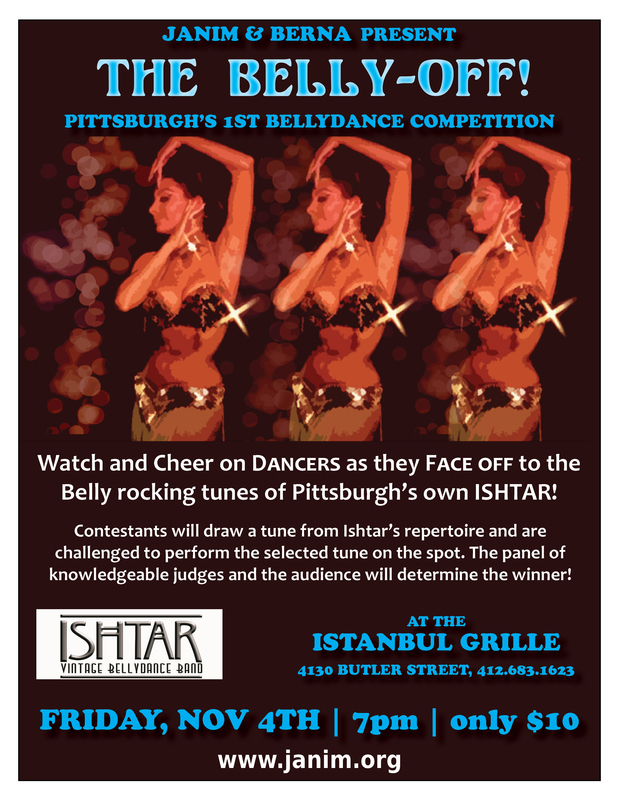 November 4th, at Istanbul Grille in Lawrenceville, watch and cheer as dancers go head to head (or is that hip to hip?) for a chance at the title! The top 3 contestants will be featured in the Gala Show the following evening! To heighten the drama, registrants will draw a song out of the hat and will have to improvise on the spot! The contest is open to dancers of all levels. There is an Entertainer category for dancers of 3 or more years experience as well as a Headliner category for those with less experience. We also have a special category for troupes! Read more at the link above! Saturday, November 5th and 6th, A Weekend Intensive of Workshops with Bellydance Superstar Sherena! The workshop topics include Ballet Bellydancer Bootcamp, Practice versus Performance, and a Gypsy Skirt Dance Choreography with Zills! Registration is only $125 and includes all the workshops and admittance to both the Belly-Off competition and the Gala show as well as an Event T-Shirt! Registrants can also swap the two show tickets for the entry fee as a participant in the Belly-Off! We will limit the number of workshop participants to allow Sherena time to work with each member one on one. Questions? Feel free to email me (Janim at jengal55@gmail.com) at any time! A Gala Show featuring Bellydance Superstar, Sherena of Ohio! Our final announcement for the weekend is the Gala Show featuring Sherena and many talented dancers in the region with the Belly-Rocking tunes of Ishtar! The show is Saturday, November 5th at Istanbul Grille in Lawrenceville. Doors open at 7:30 and the show starts at 8pm.Admission in $12 in adn=vance and $15 at the door. Children under 12 are free! Istanbul Grille serves fine Turkish Cuisine. Call ahead for dinner reservations prior to the show! Istanbul Grille is also BYOB and charges a minimal corking fee so plan ahead! Once again, looking forward to this exciting weekend of Bellydance Fun! Hope you can join us!!! Hey friend i like your blog well done! Previous PostPrevious Ishtar at the Geyer Performing Arts Center!